I use EdMar rayon threads for working BE designs. EdMar threads are 100% rayon, come in 7 weights and numerous beautiful bright colors AND they are z-twisted. DMC and Anchor floss and perle/pearl cotton threads are s-twisted. Mary Corbet does a great job discussing difference between z-twisted and s-twisted threads on her blog page Needle’N Thread. A search on Ms. Corbet’s website using “EdMar” provides links to several of her blog pages that discusses BE. EdMar rayon threads are worked as is. Never attempt to split the piles. Remember when purchasing your threads, especially variegated ones, about dye lots. If you need to purchase more than one skein of the same weight and color, request that the store selects thread skeins that are from the same dye lot. 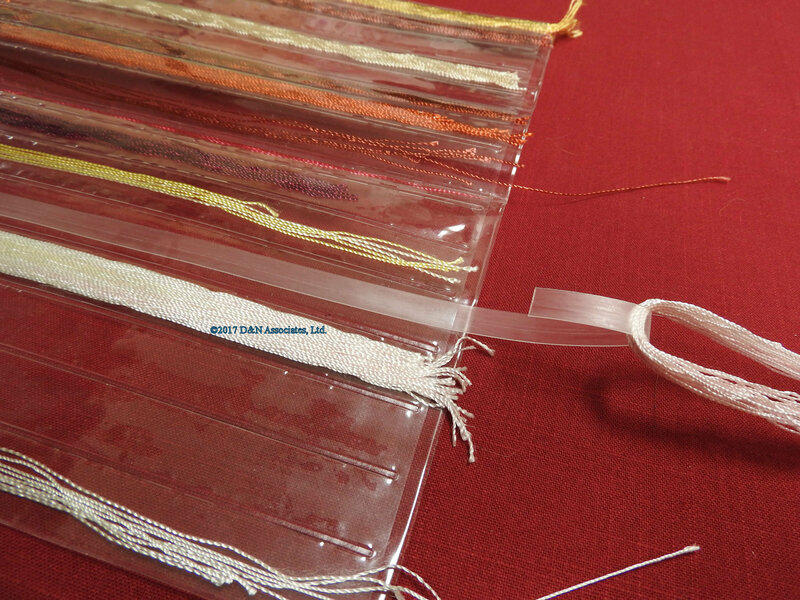 As with DMC, Anchor, etc., because of dye lots, the color of EdMar thread can change slightly from dye lot to the next. Below is a JDR-BE design that I requested as a Christmas gift. When I was ready to order the threads I realized the colors listed for the design noted a dark red or purple shaded thread for the mums so I sent an email to JDR-BE and asked them if they still had the lovely yellow-orange variegated thread for the bullion stitched mums JDR-BE design. Below is the photo of the mums design and reply to my email. I really appreciated that email from Sunshine (senior designer at JDR-BE) as I quickly found out that I really needed a 5-inch straight needle (not tapered at the ends) for those super long bullion stitches. If you are interested here is a link about Sunshine. Numerous e-stores carry EdMar. I have ordered from JDR-BE and A Stitching Shop. 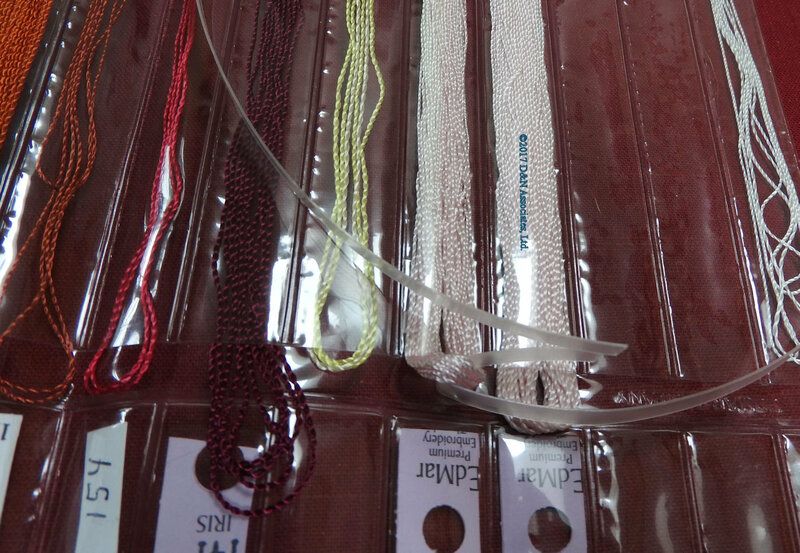 If purchasing a kit from JDR-BE or Astitchingshop I have been able to change out the color of a thread when ordering. Such as if a flower within a BE design was shown as purple and I wanted to work it in orange, etc. Take your time and shop around. In 2016-2017 JDR-BE and AStitchingShop charged $1.90 per skein. But I also found that other e-stores were charging $3.90 a skein. You can see why I order from JDR-BE and AStitchingShop! JDR-BE offers several beginners kits for learning BE. First one I worked is shown below, which I purchased within the Beginner’s kit as I needed the BE needles and stitch instructions. Plus I had no idea what the different weights of EdMar were (for stitching with them). Click any of the below images to view the blog page that discusses that design. Sunshine is owner and senior designer at JDR-BE. 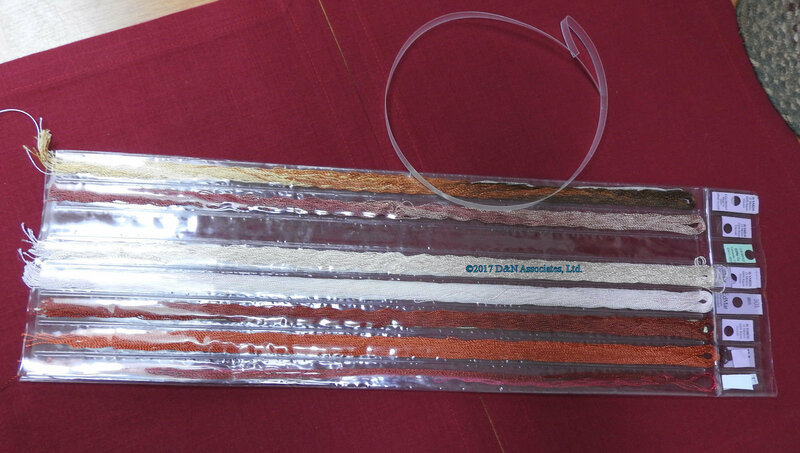 I have e-mail chatted with her or an JDR-BE employee several times, especially when I was wanting to ensure the colors of the EdMar thread I was purchasing would be same or near-same as within the photo image of a BE design that I was purchasing. If you are interested in BE, take a look at the photo pages on the JDR-BE website and be prepared to drool as they offer hundreds of BE designs and kits. Also JDR-BE website has links to several articles under their Information section (at this time, located lower right side of their main page). I would suggest reading through the articles as they contain helpful info such as there is a right and a wrong end (to the EdMar rayon thread) to sew with. That article states to gently untwist (unravel) each end of the thread. The end that unravels into three strands and looks like a brush is the end you sew with. Truthfully I normally give up trying to determine the right/wrong end of the rayon thread and just begin to stitch but you should read the article. 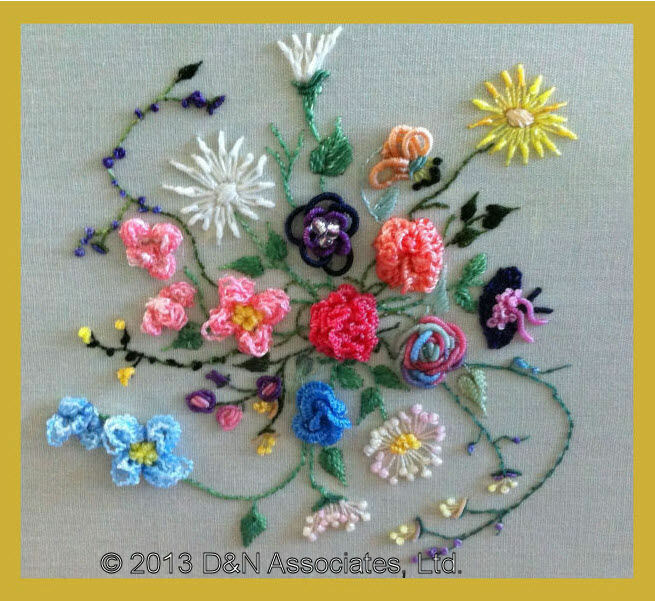 As with JDR-BE I have gotten great service from A Stitching Shop through email the owner Christine. Over the years I’ve seen this and that photo of a worked BE design and as normal no info about design name or designer. Christine has been super helpful via emails when I am looking for a specific BE design of which I only have an image grabbed off of pinterest.com and such. So far I have been lucky on these quest for it has turn out that Christine knows where to order a printed fabric of the design and then she’ll kit up the threads after we discuss colors and send it to me. As mentioned EdMar BE thread is 100% rayon. Once the skein is open you’ll probably find the rayon thread ends to be quirky, wanting (due to static) to go this way and that. The JDR-BE link thread storage discusses storage within a 16 slotted plastic organizer (shown below). My below photos are to provide you with a closeup of the 16 slotted thread organizer and the plastic thread puller used to take the rayon thread through a slot. I didn’t have an unopened skein of EdMar Rayon to take a photo of so I am using one from the JDR-BE.com website for a brief discussion. 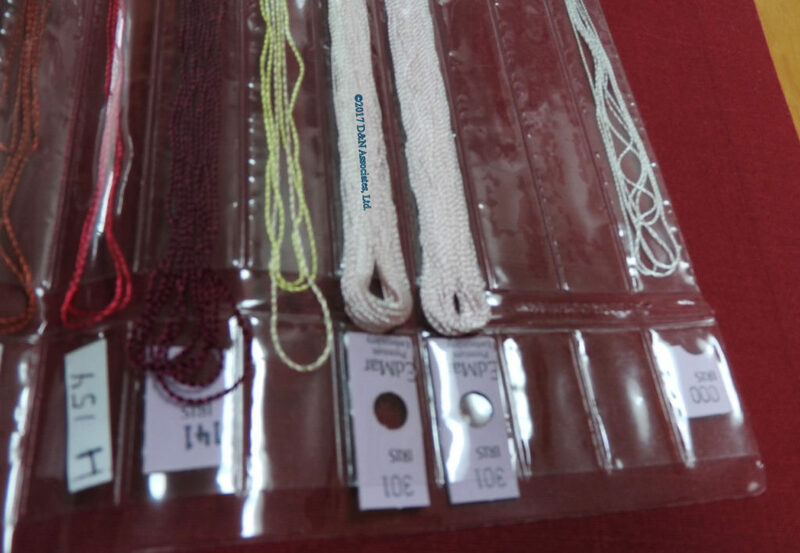 When I am planning to slide a skein of EdMar rayon into one of the storage slots I do it in the following steps. Step 1: Take a look at the photo and imagine removing the scissors (without cutting the threads). So you wind up with two loops, let’s call them the top and bottom of the skein. Step 2: Holding onto the top and bottom loops, untwist the skein so you have a continuous loop that is about 16-inches long (I am doing this from memory so I might be off on the 16-inches). Step 3: I slip the top or bottom loop onto the plastic puller. See second photo below. Step 4: I slowly pull the uncut skein through the slot until the second loop of the skein is sticking out of the bottom of the slot. I have no photo of this at this time for as I said above I do not have any unopened EdMar skeins on hand. Mine are all, already, stored in slots. Step 5: With this second loop sticking out from the bottom of the slot I then snip it as shown in the above photo. You would now have only one loop of threads and that is on the plastic puller. Step 6: Slowly continue to pull the puller through until the loop of threads is just outside of the top of the slot. This is shown in the fourth photo below. Step 7: Carefully remove the puller so you don’t snag any rayon threads (and possibly pull it (the rayon thread)) out of its slot. Storage EdMar rayon threads — when needing to remove a thread from a slot do it one thread at a time as I am doing with the yellow rayon thread by pulling on the loop. Pull slowly so you don’t bring more threads with you. I rest a fingertip on the slot to try and keep the other threads from being pulled out. If I do, then I’ll take all of the threads out of the slot, and use the puller to take them back into the bottom of the slot and pull through again. It’s a pain to have to do that, but I don’t want a pile of loose threads lying about my stash. Here’s an interesting downside … rayon thread can be a bit unruly. It wants to curl as you stitch and the knots (starting and ending of the thread) don’t want to hold. 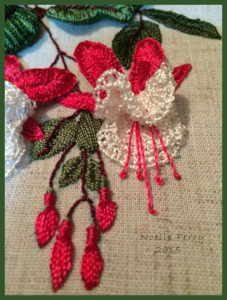 It was when first working with rayon thread that I began to stop using a knotted end when starting a new embroidery thread. The ends of your threads are secured by weaving them into the back side of the worked area of your design. I like to take the thread through the back of a worked area then flipped the needle and bring the thread though a second time and since it is rayon thread I do a third weave through after which I snip the thread off. Yes, this uses 2-3 inches of thread up but rayon thread is a slippery little devil so you need to be sure to securely weaved in the thread ends. Course you need to park your thread(s) aside until you have enough worked area into which you can weave in the tail ends of your thread. You need to choose how you are going to park your thread until you can secure the tail end. If you stick the needle through and pull the thread through to “park the thread” the needle might leave a hole in the fabric so be sure to park your thread(s) in an area of the fabric that will eventually be covered with stitches. 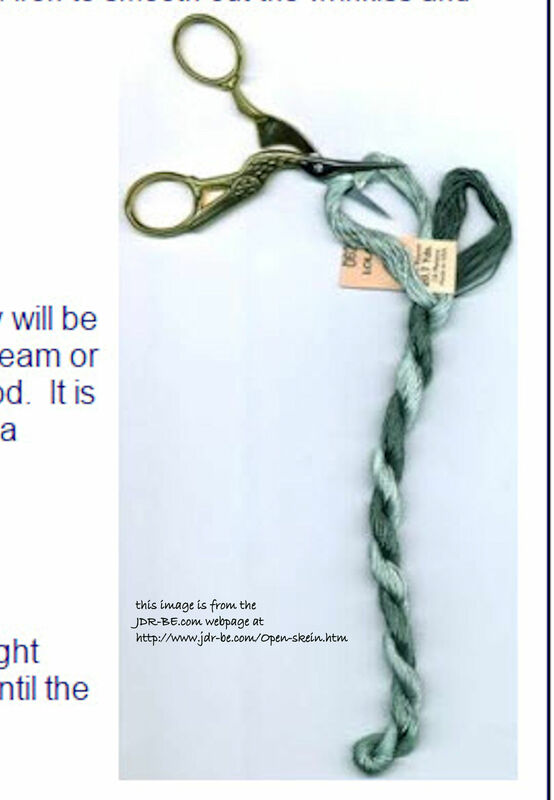 Two of the JDR-BE articles you should read are opening a skein and Straightening the thread. Back to that “curling” behavior as you stitch. Normally I want a dimensional look to my BE stitching. So I like that the rayon thread wants to curl a little bit, especially for when I am working on the petals of a needle lace design like Loretta Holzberger’s Swingtime Fuchsia. 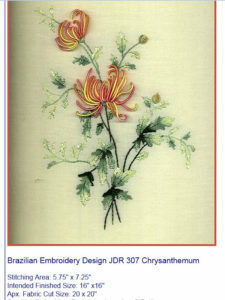 But within this same design I wanted the rayon thread used for the leaves to lie nice and flat. To achieve that can you steam and completely dry the rayon thread before using it. That is discussed in the above article Straightening-threads. 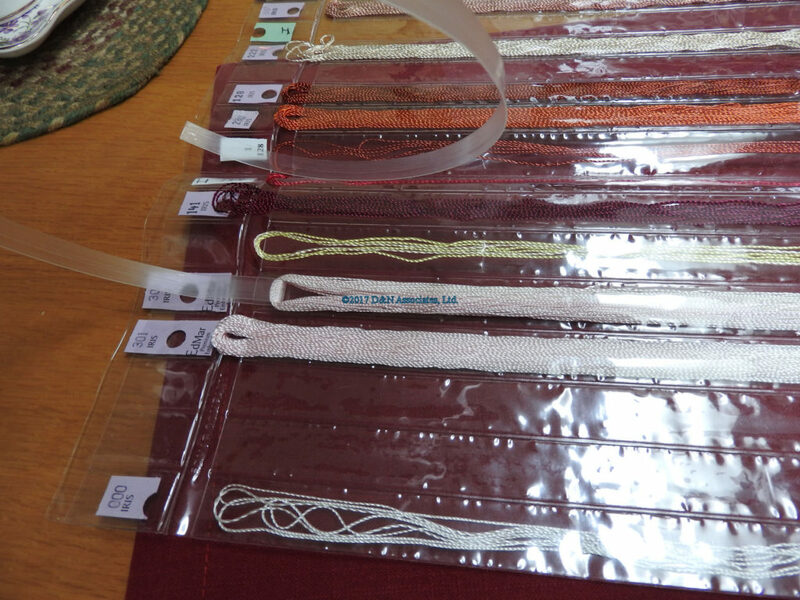 What I do is place the needed threads in the clips of a skirt hanger so that the long lengths of threads are hanging down. Then I hold it (threads and skirt hanger) over a pot of steaming water, just for a moment or two. Because the threads are so long I normally loop them over the straight metal of the hanger. You can see the threads relax in the steam. I then hang the skirt hanger in a dry place with the thread hanging straight down and once dry, I then hand curl the threads into loose loops, store in quart or gallon size plastic bag and use the relaxed threads. Another method is to place the threads lengthwise in a long towel and dry iron them with the towel protecting the threads. Again, don’t use the threads until they are completely cool off and dry. I have not had any of my EdMar rayon threads break while stitching but I have seen web discussions of this happening to other stitches. My suggestion is if they have been steamed or ironed, make sure the threads are well dried and cool before stitching with them and watch your stitching tension so you aren’t stressing the thread by tugging on it or such. 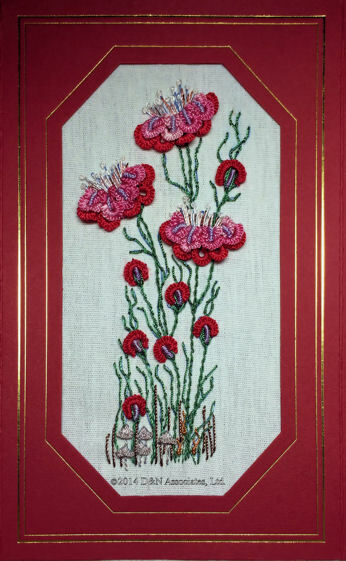 The website http://www.bdeig.org/education.html shows some of the BE stitches I have used and also offers free BE designs. 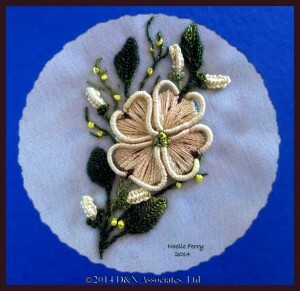 BE designs often used extra-long (25+ wrapping) bullion stitches. 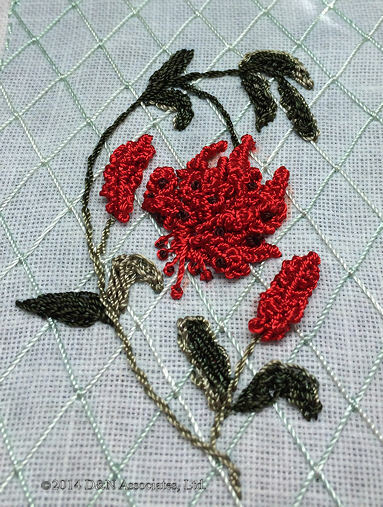 I normally use a straw needle (which is non-tapering) for my bullion stitch such as for the 50 wrapped bullion of my dogwood worked design I used a 5-inch long straw needle. I have learned, when working a bullion stitch, to use Thread Heaven, running the rayon thread through it and also the length of the needle. Click the Carnelias photo below to view WIP photos using the Thread Heaven wax.